Event Description : Natarang Pratishthan presents "Rang Smaran" an event dedicated to four significant theatre groups of Delhi. Post independence, several groups and individuals emerged in the country who contributed significantly in the development of the theatre activity in that region. The Pratishthan has been archiving the works of theatre groups and personalities of the country. 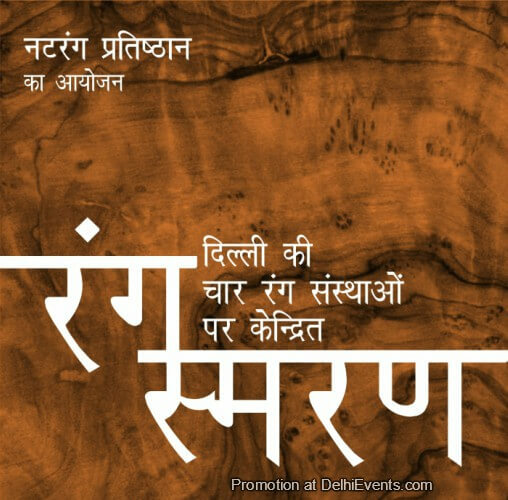 In its Rang Samvad series it organised dialogues with several theatre personalities and now through Rang Smaran it wants to bring alive the memories and underline the contribution of some of the significant theatre groups of Delhi. Last year we began this series with four iconic theatre groups of Delhi. This year we take up other four significant groups of Delhi ie Theatre Arts Club, Theatre Action Group, Prayog and Sambhav which gave a definite direction to the theatre activity in the city. Unfortunately the work and contribution of most of these groups is not remembered or known to the present generation of theatre workers. Through this programme we hope to relive those memories and record an oral history. On this occasion we have invited the prominent group members to share their memories of challenges, activities, history, processes and anecdotes related to the group and observations related to the general theatre environment, performing spaces, audiences, modes of publicity etc of the times. In the process we will not only be able to share these forgotten moments with the present generation but also be able to document it for the future generations. This will be virtually a festival/feast of memories with a small exhibition of the photos, brochures playlists etc that will give a glimpse of the journey these groups have taken..